Larry and his father enjoyed frog hunting during his teenage years. This interest in frogs followed him into adulthood. As friends and relatives learned of his interest, they started gifting him with artificial frogs, over 100 of which reside inside the house. Some live in the garden. Some we bought ourselves. Others are part of the "attic collection". When we moved to our current home, frogs already lived here. A friend dubbed the house and property "FROGHAVEN". In subsequent years, we built two ponds, and as they say, "Build it and they will come!" 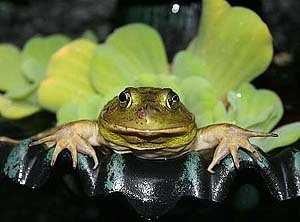 Now we are the happy audience to nightly frog concerts. Below are some of our resident frogs and their relatives. A CD of Lily pad Love songs has been produced by frog expert Walter Knapp, who is a nature recording specialist. 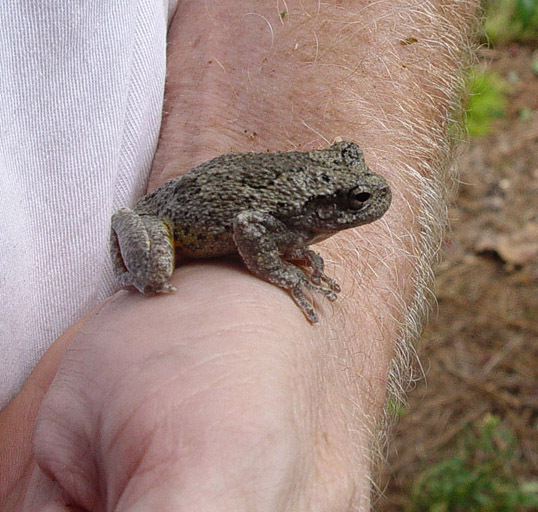 The CD is called "Calls of the Wild, Vocalizations of Georgia's Frogs" and features the mating calls of Georgia's 31 frog species - and one from a nearby state that may also be in Georgia but has not been seen yet. Money generated from sales of the CD go to the state's wildlife conservation fund. 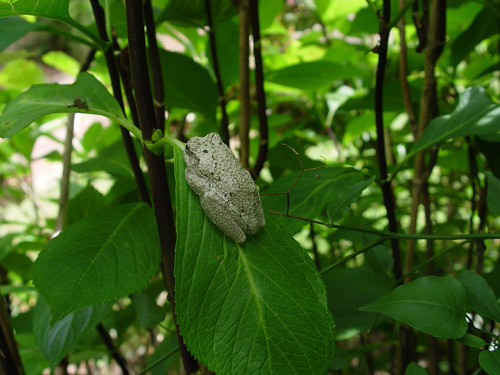 Hydrangea Frog - We found this little guy hiding among the branches of the Hydrangea Nigra. 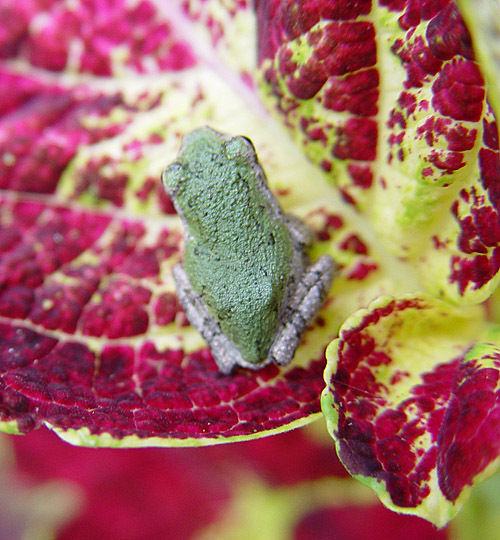 Coleus Frog - He didn't blend in very well with the foliage of this brightly colored coleus. 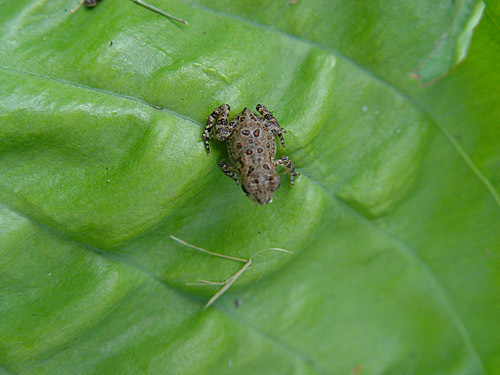 to see if you recognize the mating calls of frogs living in the Eastern U.S.
Reunion Frog - Dozens of these very small frogs entertained the kids at our family reunion, here perched on a hosta leaf. 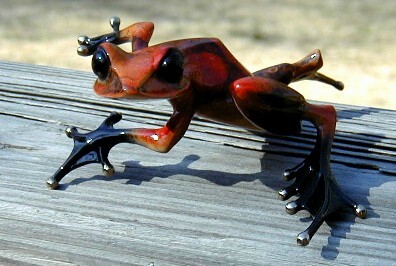 Buckeye Frog - He crawled among the leaves of the Buckeye and hopped from branch to branch. Disclaimer: These are obviously not the scientific names of these frogs, just the nicknames we have given them. A front pond resident One of the smaller frogs that frequent the front yard pond. 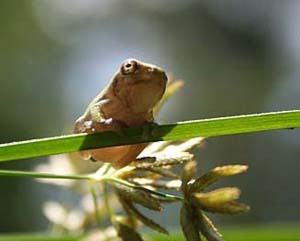 Back pond frog -The back pond houses smaller frogs, but greater numbers of them. 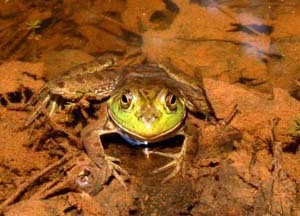 This big bullfrog lives under the bridge in our fake creek. At Callaway Gardens, Pine Mountain, GA. This elegant creature lives in the Sibley Butterfly Center. Callaway Gardens frog - It is evident what the frogs at the Sibley Butterfly Center live on. 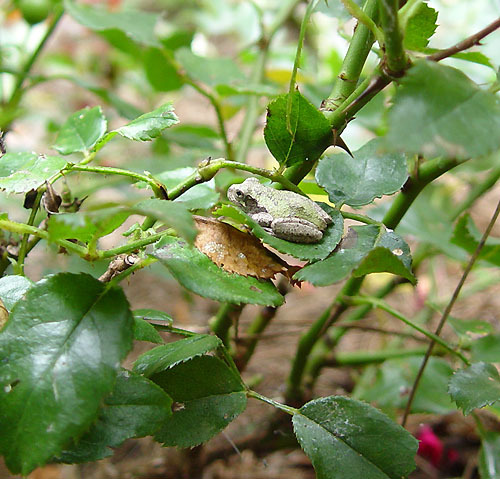 These small frogs hide among the roses. Chicago Frog - This giant frog overlooks a downtown street in Chicago. Diego, our living room frog - Diego came from an art gallery in San Diego. Artist:Tim Cotterill This series of four frogs were contributed by hawk rehabilitator Monteen McCord, who is a wonderful photographer. You can see more of her work (frogs, cats, creatures of all sorts) at her website. 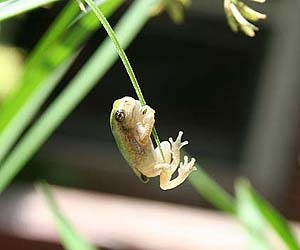 Waterfall frog - A cool place to be is the top of the waterfall in the back yard pond. Deck frog These small frogs hide among the plants and pots on the deck. Bog Frog - This fine looking fellow hangs out in the bog garden next to the front pond. 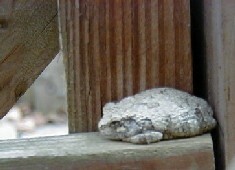 A back porch frog - One of these little grey frogs was found on the bottom of the bird bath. Singing Frog This concrete frog graces our deck and sings even when it snows. 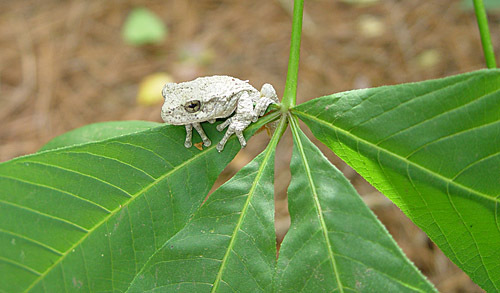 Grey Frog Like a piece of putty, these little specimens sit in corners, like puddles, or hide among the branches of plants. We finally made a sign for Froghaven and placed it on the front porch with a concrete frog. Wrist Frog This little frog was not afraid to climb all over Larry and his shirt. 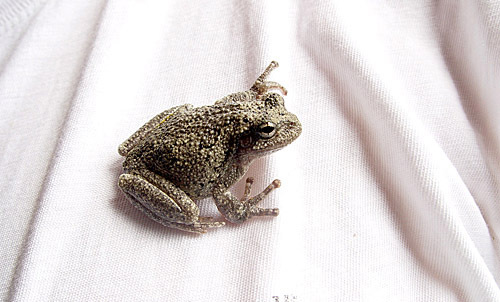 Shirt Frog? As Larry worked near the pond, this little guy was his companion. Well-dressed Frog He looked plain until Larry turned him over to reveal orange pantaloons! Horicon Marsh Frog This little leopard frog was one of dozens that leaped out of our way on the Horicon Marsh trail in Wisconsin. 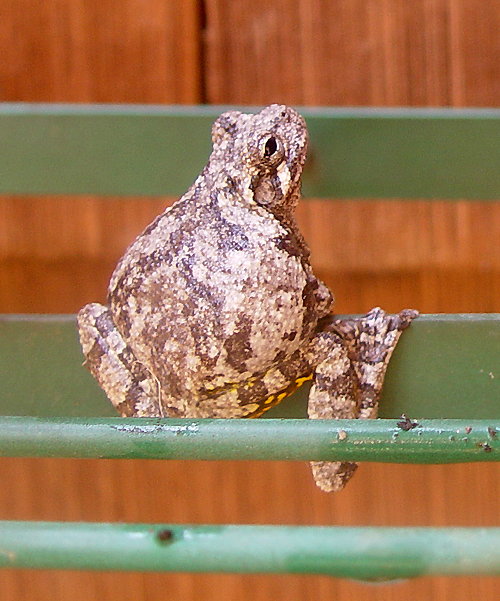 This fat frog was found hanging on the plant stand after the plants came in for the winter.